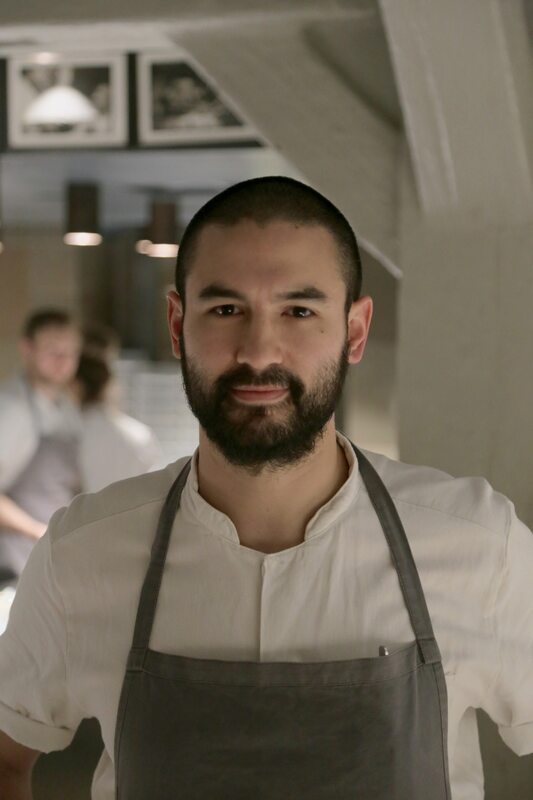 Ben Ing, above centre, has taken the coveted role of head chef at Noma, a critically acclaimed restaurant in Copenhagen, Denmark. Photo courtesy of Ben Ing. Ottawa fry-cook-turned-chef Ben Ing has been awarded a top spot as head chef at the esteemed Copenhagen restaurant Noma, a two Michelin-star restaurant specializing in Nordic dishes and seasonal fare. Ing started at Noma in 2014 as a chef de partie, an apprentice chef, and rose to his new position in just two years. The restaurant was No. 1 on the World’s 50 Best Restaurants List in 2014, and placed third this year. Ben Ing got his start as a busboy at Lapointe’s in Kanata. Now he’s a top international chef. Photo courtesy of Ben Ing. Travelling and working in fine kitchens from New York to Denmark, Ing has certainly had an interesting and successful career in the food industry. But his humble roots start here, in Kanata. Twelve years ago, Ben Ing was working as a busboy at bustling fish monger and restaurant Lapointe Fish in Kanata, playing hockey with the Ottawa Junior Senators and hanging with his friends. One evening, when one of the other chefs couldn’t keep up with the rush, owner and executive chef Jeff Parladg asked Ing to trade his dish cloth for an apron and a spot on the fry section. “It was a good learning experience. I just sort’ve jumped into it,” he says. He credits the chefs there with his first introduction to kitchen culture. It was an act of kismet; the only cooking experience Ing had at the time was cooking dinner before his evening hockey practices when his parents were still at work. Under the stern and able tutelage of Parladg, Ing decided to enrol in Algonquin College’s culinary management program. Ing’s biggest inspiration came when he was working at the Fraser Café in New Edinburgh, with Ross and Simon Fraser, after he finished school. It was Ross who opened his eyes to international travel, says Ing. His style of seasonal cooking, a specialty of Fraser Café and Noma, leads his choices. Summer brings more leafy greens and zesty garnishes, while the game season brings meats with marbling, a comforting heaviness, and smaller portions. In his new role, Ing will oversee the operations of different sections of the kitchen, the menus, calling and expediting a smooth service, and ensuring quality of the food and maintaining the high standards a two-Michelin star restaurant demands. When things get tough with his team, he tells them to move on from the past, learn from their mistakes, and focus on the next service. He works closely with the head chef, René Redzepi, and others like the sous chefs and the pastry chef, but he says he isn’t central to the creative process. Ing and other Noma staff will be in Australia in mid-January to kick-start a Noma “pop-up” restaurant, and a new incarnation of the original restaurant will open in the Danish capital in the new year. No matter where Ing is globetrotting, he likes to get home to Ottawa to spend time with friends and family when he can. He flew into the city on Jan. 2, with two gruelling layovers. Although Ing wasn’t able to get back for Christmas, it’s a “nice treat” to come home for part of the holidays. He’s looking forward to dim sum with his family, as well as meeting up with some of his chef friends and going to restaurants like the Manx and Arlington 5. Ing says there are a lot of similarities between the Ottawa and Copenhagen food scene, which may be surprising to some. Ottawa’s food community is quite close-knit as well. “It’s a small big city, and there’s a lot of restaurants in the community that are supportive of one another and really help the scene grow together as one”. He says a new generation of chefs is springing up, who have trained under such star Ottawa chefs as Matt Carmichael of El Camino fame, and restaurateurs such as Stephen Beckta. While he will stay with Noma for the foreseeable future, one day he would like to work with professional sports teams in the field of nutrition. Indulging his love of really good coffee and opening his own coffee shop and café is also an option. Although he’d like to eventually return to Canada, Ing says that his next port of call will depend if his girlfriend from the balmy state of North Carolina will brave the wintery weather of Ottawa.